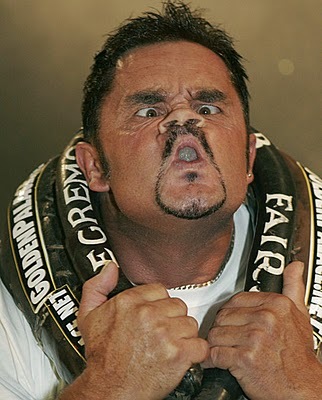 Lets look at the art of gurning. Yes, that is the Queen of England in the picture. 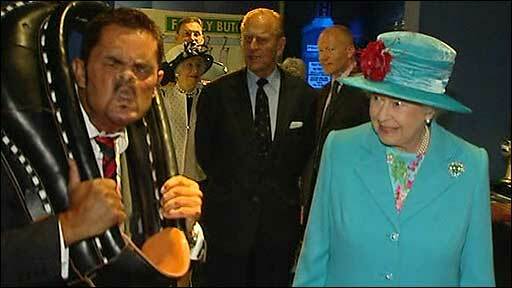 Why is the Queen being confronted with this? The man on the left is the very best at this sort of thing. He won the Egremont Crab Fair gurning competition, and that makes him world champion. The Egremont Crab Fair was founded in 1287, and the video below says the gurning began in 1267, so it took a full twenty years before these worthy men were recognized for their contributions to society. The horse collar is used during the contest. Competitors put their heads through the collar when performing for the judges. Here’s a better shot of the same guy without the Queen. Here is Mr. Mattinson explaining the history of this peculiar sport.